Sir Christopher Snowden and Darren Henley sign new agreement to champion creativity in Southampton. 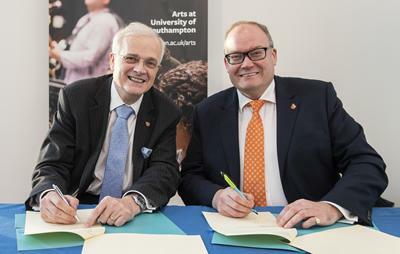 Southampton’s growing reputation as a city of culture and creativity has received a major boost with the signing of a new agreement between the University of Southampton and Arts Council England (ACE). Thanks to a new Memorandum of Understanding, the two long-standing partners will embark on a new phase in their relationship with a strategy to further champion the provision of arts and other creativity-focused activities throughout the City of Southampton and the wider region. Through its own arts and culture strategy, the University has already committed to animate the City’s inspiring arts and culture offering, increasing access and engagement by placing students, staff and diverse communities at the centre of its plans. This new shared commitment will see the University and ACE working directly to embed creativity as an essential part of everyday life for everyone in Southampton and the surrounding area, particularly children and young people. establish an evidence base to capture the impact of how the Southampton’s Cultural Quarter as a future creative arts hub can enrich the lives of children and young people, acknowledge and develop best practice, addresses inequalities, remove barriers and seek to contribute towards national policy. Over many decades, the University of Southampton has developed and nurtured a pioneering history of cultural patronage through the arts, theatre and music, playing host to some of the city’s most respected and renowned venues including the John Hansard Gallery and Turner Sims Concert Hall. The institution is also home to a research-active Arts and Humanities Faculty encompassing the Winchester School of Art, as well as a successful and well-connected multidisciplinary Public Engagement with Research Unit, and over 40 performing arts student societies.